Description: The search for meaning is at once very old and extremely contemporary. Existential questions about origins, our destiny, and the purpose of our lives are no less meaningful today than they were in previous centuries. Since time immemorial, people have tried to find their way in life and to give it meaning. Do things 'have' meaning? Do we 'give' them meaning? And how can we live life to the full? In this book, the authors attempt to provide a few pointers. In the first part, the historical-cultural evolution from mystery to disenchantment is laid out, particularly with regard to our approach to the Bible. In the second, possible responses to this disenchantment are described, ranging from reactionary fundamentalism to enrichment through critical approaches. Finally, the third part offers biblical answers to fundamental existential questions, including those regarding our origin and destiny, human co-existence and social justice, and the relationship between God and human history, and the human experience of violence, suffering and love. This book highlights the way in which biblical literature is essentially and authentically associated with human existence and our quest for meaning. 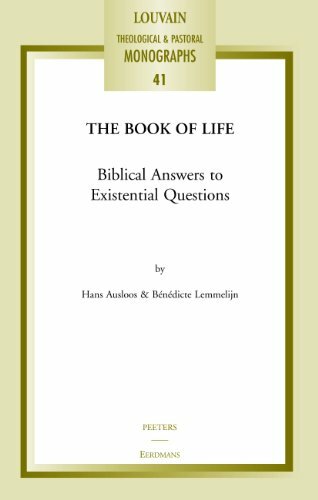 Citation: Jordan M. Scheetz, review of Hans Ausloos and B�n�dicte Lemmelijn, The Book of Life: Biblical Answers to Existential Questions, Review of Biblical Literature [http://www.bookreviews.org] (2014).